Two years ago, the mister and I decided to try our hand at beekeeping. We set up a hive, bought the nuc (the queen and needed materials) and went about the business of watching the bees make honey. Everything looked wonderful…then the hive swarmed. 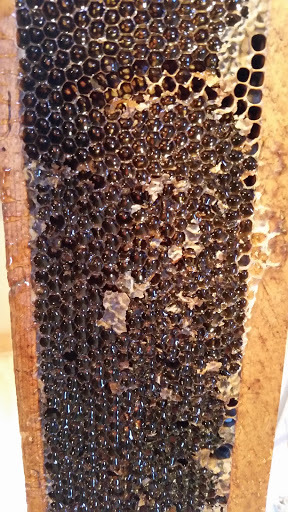 They simply packed up and moved on to another place….not one drop of honey. What a disappointment. We decided to do a little more research and try to determine if we had done something wrong. We let the hive sit where it was for the winter months, did our research and decided in the spring to move our hives to a different location. The mister went to move the hives and came in ECSTATIC! Apparently, someone else’s swarm had decided to take up residence in our hive and they were thriving! We eagerly watched the bees. When we noticed they were overflowing the hive, we set up a second hive, and many of them moved into it. JOY! We were going to have LOTS of honey! Then the ice storm of 2017 hit….freezing rain for 2 days. When the mister went to check the hives he found the new hive had swarmed *insert sad face* and the first hive had died. We aren’t sure if it was weather related, but they were fine just a few days before. 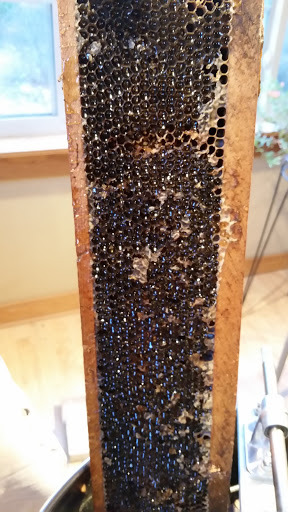 Since we had left the frames of honey for them to feed on during the winter, we removed the frames and brought them in to extract the honey that was left. How much honey can you get off 2 small supers?? 42 POUNDS!!!! We were shocked! In anticipation of honey a year ago, we had purchased an extractor. It’s a much needed piece of equipment if you are producing honey. We had to sit the extractor on pieces of wood to raise the level so the bucket and filters would fit under it. Here are what the frames look like before they are extracted. All the dark stuff is HONEY! Our honey is considered a wildflower honey because we don’t have a specific flower that blooms around here. Take my word for it…it is DELICIOUS! I am SO thankful for God’s provision. 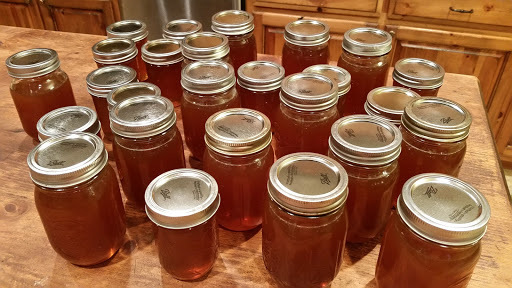 Honey is currently selling for $45/gallon here and I use a LOT of honey. Pure, unfiltered, raw honey…………..it doesn’t get much better.